THE SAI PLATFORM’S SPOTLIGHT HELPS COMPANIES SOURCE SUSTAINABLE PRODUCTS AROUND THE WORLD. PHOTO COURTESY OF SAI PLATFORM. THE SAI PLATFORM is a major food and drink industry initiative which supports the development of sustainable agriculture worldwide. The organization was founded in 2002, when three multi-national companies (Group Danone, Nestle, and Unilever) created a platform to facilitate sharing at a precompetitive level. In a global marketplace, companies often compete for market share but the primary focus of the SAI Platform has been to work at the precompetitive level, ultimately trying to drive global agriculture forward through sustainable development. Sixteen years later, the original purpose developed by the founding companies remains and the SAI Platform has grown to include all value chain partners and has reached nearly 100 members, including Grain Farmers of Ontario. Through the SAI Platform, the Farm Sustainability Assessment (FSA) has been created as a farmer focused tool to allow farmers to assess their sustainability. The FSA has been created to assess sustainable farming practices recognized in the food and drink industry, covering environmental, economic, and social aspects. The questionnaire was developed by SAI Platform members with suppliers, farmers, and external stakeholders to ensure it met the needs of the entire supply chain. There are three levels of questions within the FSA; essential, basic, and advanced. Essential questions are straightforward in the sense they deal with general practices (such as crop protection product safety). Basic level questions examine the fundamentals of sustainable practices (such as soil erosion). Advanced questions go above and beyond the fundamentals of sustainable practices (such as biodiversity). A farmer would go through the complete FSA to assess how they comply. Depending on the number of questions they comply with, a result would be given as a not yet bronze, bronze, silver, or gold. This can be completed through either the use of an Excel spreadsheet or an online assessment. Grain Farmers of Ontario worked to filter those questions which relate to local legislation and regulations to increase the ease of use and reduce duplicate questions. The sustainability environment has drastically evolved since the formation of the SAI Platform, but it too is evolving. Nick Betts, director of strategic projects at the SAI Platform, notes that the primary focus has always been to deliver new and innovative tools and resources to members which allow them to deliver sustainable outcomes within the landscape. “Over the last several years, companies began requesting a hot spot mapping tool which would allow for various forms of collaboration and increase synergy across the SAI Platform membership base,” says Betts. This mapping tool would allow companies to see where hot spots for sustainable sourcing may be and where other member companies may want to collaborate. In February, after extensive member consultation and strategic goal setting, the SAI Platform released Spotlight. Betts jokingly notes that since the release in February, Spotlight has become a “matchmaking service” for companies looking at sustainable sourcing. Through the use of the mapping tool, companies are now able to place data points on a map to share the commodity they are sourcing from a particular region and the associated sustainability topic of focus in that particular region to create a connection. For example, a company can use this tool to place a data point on a map to say they are looking to source sustainable corn from Ontario. This allows other SAI member companies to realize a similar sourcing connection if they are also sourcing corn from Ontario. Ultimately, this connection reduces duplication within sustainable sourcing. Connections can also be made based on sustainable themes that may be cross commodity. As Betts notes, this sometimes allows for broader connections amongst companies. An initiative has started in Mexico because of the Spotlight tool for sustainable labour. Betts says this project took off very quickly. The reality is that prior to Spotlight none of these companies worked together. The tool has enabled the connection to spur collaboration in a pre-competitive forum. As sustainability continues to evolve, the SAI Platform continues to provide tools and resources for its members to advance sustainable agriculture globally. With this evolution we are also seeing the sharing economy within this industry. Major multi-national companies are interested in working together to achieve positive outcomes and the Spotlight tool enables a connection to begin these collaborations. JEFF BARLOW AT SAI CONFERENCE. The Sustainable Agriculture Initiative (SAI) Platform Conference and General Assembly was held in Aarhus, Denmark this spring. Grain Farmers of Ontario was represented at the conference by Jeff Barlow, director for Grain Farmers of Ontario District 6 (Haldimand, Brant, Hamilton, Niagara), and Michael Buttenham, sustainability and environment coordinator. Aarhus is a well-known Danish food technology centre and the theme, “Sustainability through technology and innovation: How to Advance Sustainable Agriculture at a Landscape Level” tied in with major industry within the city. Barlow had the opportunity to present at the conference speaking on big data on the farm and what this means for achieving optimal sustainable outcomes. He participated on a panel with Tim Taylor, CEO of Valley Agricultural Software, Aart van ‘t Land, director of business development at Lely Holdings, and Mathieu Lamolle, senior advisor sustainability standards & value chains with International Trade Centre. Barlow explained how he utilizes technology on his farm, Barlow Farms. He spoke to the audience of food and beverage sector leaders about how a farmer’s data is their own recipe for success and there needs to be an open dialogue when it comes to data sharing between the farmer and various supply chain partners. 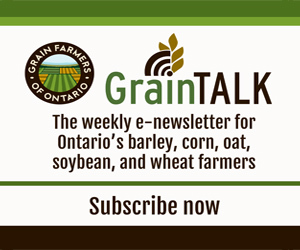 Michael Buttenham is the environment and sustainability coordinator for Grain Farmers of Ontario.